Shree Prasad Sapkota  is an ex-military man, known for his hard work and disciplined life. You can imagine his shock and sadness when he discovered he would no longer be able to walk, after suffering a spinal cord injury. He had fallen from a tree while collecting fodder for his animals. “Post-accident, it was difficult for him to accept that he could no longer work,” says Shree Prasad’s son, Madhav. 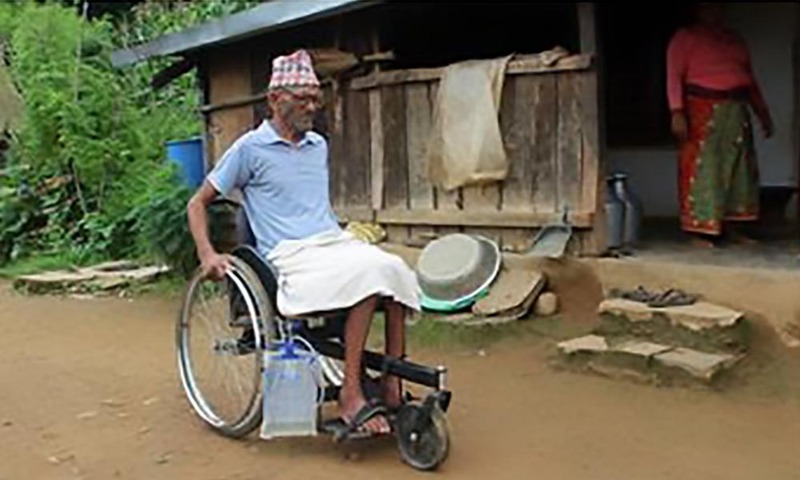 Shree Prasad went to INF’s Green Pastures Hospital for rehabilitation, where he was eligible to receive a wheelchair. He and his wife live by themselves, so without a wheelchair, it would have been very difficult for her to take him out of the house. Shree Prasad has been using the wheelchair to complete daily living activities, and contribute to household chores. He can go and feed his goats in the morning, for example. The wheelchair has helped his family’s ability to care for him, and also improved his sense of autonomy.